The list of things you need to take into account when selling your home is extensive. Please remember that a really great agent knows how to help you get these things done. If you have the time, many of these things are totally DIY. If, however, you are selling your home and need resources to help get your home ready for market fast, then lean into your agent. I have a long list of vetted professionals that I am happy to share with my clients; and a top-agent in YOUR local market will too. We are here to get your home on the market quickly and SOLD for top dollar! In Part 2 of this three-part series, we look at Tips 3-6 – The importance of light, inside and out, of clearing the visual field and taking out the trash in more ways than one! 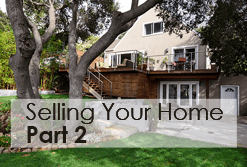 TIp 3 – Selling Your Home? Let the Light In! It’s all about light! I know it’s not a favorite task when selling your home; however, cleaning your windows goes a long way toward letting in the light. Make sure to clean them inside and out; and if you live in apart of the country where you have storm windows, clean those as well. Yes, the screens too. Clean the window sills to and all the nooks and crannies. It’s a BIG job; however, your Realtor can tell you about the tangible benefits of clean windows when selling your home and suggest the best way to hire a professional if that is a better option for you. Consider replacing drab or heavy drapes with ones that brighten the room. Prune bushes and tall plants away from the windows to clear the view and let in the light. Since each house is different, when selling your home, talk to your Realtor about the best way to use the outdoor plants you have to maximize curb appeal while you also allow for maximum light inside and visual appeal from inside. Make sure to remove the clutter in and outside your home. And, as sad as it may seem, it is important to depersonalize your home – You want perspective buyers to be able to imagine living there. That is easier when the family photos and memorabilia that mean so much to you are put away. Clear the visual field so buyers can imagine THEIR photos on the walls! And remember the Best Kept Secret we talked about in our article about staging when selling your home? Circle back and find out! Inside your home, take a look at your lampshades and light bulbs. When selling your home, swap out dingy shades for fresh, light-colored ones and install brighter, room-flattering bulbs. Since bulbs now come in all sorts of color-correcting tones, consider the best type of bulbs to use in your home. Remember, the best bulb-choice may be different from room to room, depending on paint color and availability of natural light. You want to use bright and space-flattering bulbs in wall and ceiling fixtures, ceiling fans, the range hood and closets too! Outside, you want your home to really POP at night. Clean the glass on ALL outdoor fixtures and add bright bulbs. Ask your Realtor about putting certain lights on timers or motion detectors. Buyers like to drive by a home they are interested at night, so if you are selling your home, make sure yours looks inviting and safe when they do drive by. If you are selling your home you want your house to be debris and odor free! This means going through and cleaning out the old wood, paint, never-used sports equipment and tools in the garage, the old medicines and cleaning products around your home and expired or never-used things in your kitchen. Think of it as a good Spring Cleaning. And by all means scrub out your trash cans, waste baskets and other trash/recycling bins and containers. Once clean, use liners to keep them that way! Since we can become immune to the odors we live with, once the trash and debris is gone and your cans are clean and lined, ask a trusted friend to give your home a good “sniff test” to see if there is anything you missed. Funky odors are a definite no-no when selling your home! Please check back in two weeks for the final post in this series: Selling Your Home 12 Best Tips – Part 3, where we look at what to do about pooches, pet peeves and pricing! Did you miss Part 1 in the series? Click Here! If you live in the San Francisco Bay Area, are selling your home and have questions, I would love to hear from you. The information contained in these posts only begins to scratch the surface of the value I bring to the table. With a quick call you will know if I am a good fit for your needs and if you would like to schedule a meeting. I look forward to your call whenever you are ready.